Life for me started to change when I turned 40 in 1993,” explains Bill Tonkin, guitarist in Beatles tribute band Not The Beatles. “My daughter came home from school after a lesson about how bad smoking was for you. She was so convincing and sad about my 30-a-day addiction, I gave up there and then. I’d also just changed jobs and now worked with a guy who was a brilliant classical guitar player. I wasn’t a player then, but I explained to my wife Carole how I was enthralled by the looks and sound of the guitar. “I also thought that if you work hard, and if you don’t spend any spare cash that you have, you are working for nothing and, for me, guitars are the best thing to spend money on. “At the time, she made it clear how much money I was saving from packing up smoking and suggested that I buy a guitar. From here on, I have to say that although I know what I want and what I’m looking for in a guitar, Carole has been responsible on more than one occasion for the guitars I own today. 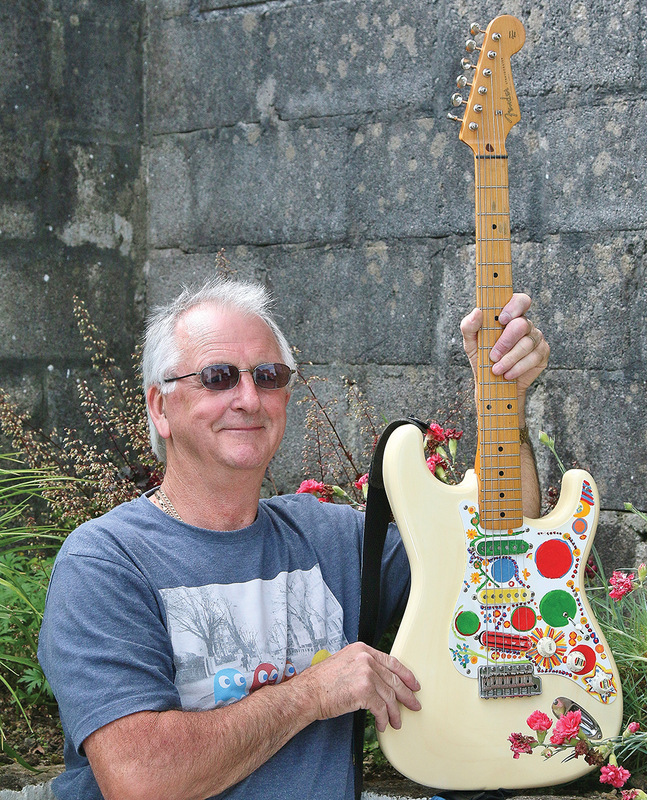 “I didn’t go down the classical road, but bought a white late-80s Japanese ’57 reissue Strat from a guitarist in Cornwall called Chili Dog Slim, and being a George Harrison fan, I had a friend paint the body and scratchplate in the design of George Harrison’s Rocky. I’ve since removed the artwork from the body and just kept it on the scratchplate. “As George Harrison once said: ‘The Beatles saved the world from boredom’. I certainly agree with that. I’m from The Beatles’ era, and after a few of us got together to casually play some of the Fab Four’s classic songs, we realised we all had something in common. “We have been gigging regularly as Not The Beatles in the south west, where I’m taking George Harrison’s guitar and vocal parts. Hence, I have many of the models he used, along with a selection of Vox amps and cabs which I use live, including a pair of Vox Grenadier columns from ’66, a Vox Supreme also from the mid 60s, a Conqueror 2×12 cab and a reissue AC30. 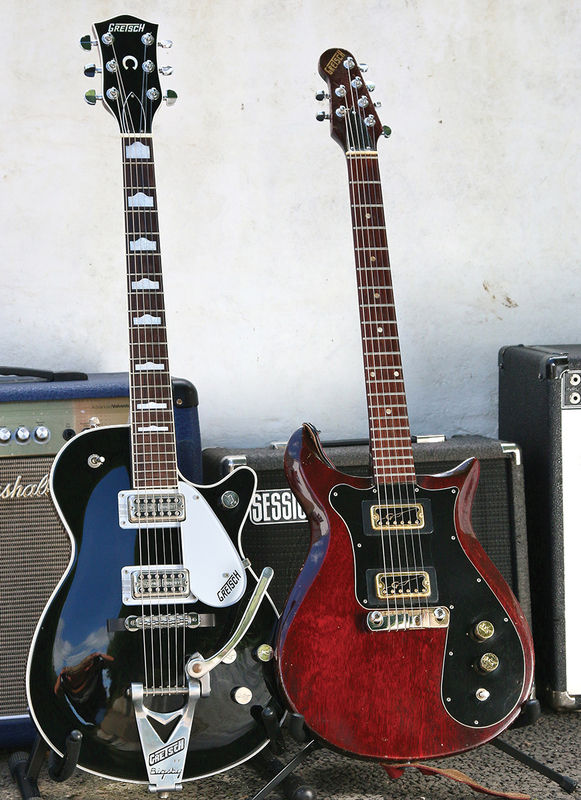 “I swap guitars around a lot during the set, although my main guitar is a Gretsch Country Classic 11. I think this model was only built between ’80 and ’92. It’s backed up by my Cherry Red Gibson SG from ’83, to which I have thought about adding a Vibrola for a bit more of a George vibe, and a ’97 Epiphone Casino built at the Fujigen factory in Japan. 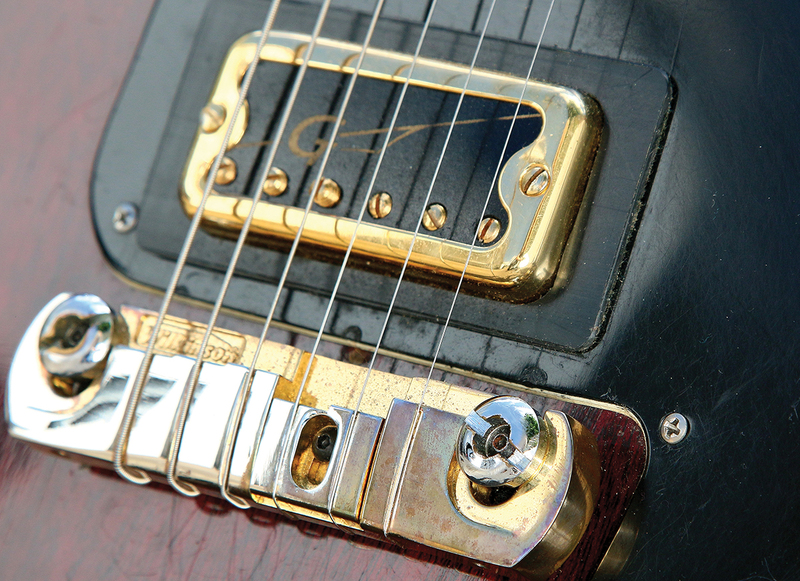 I’m not a badge snob, I really don’t mind where a guitar was built as long as it sounds and plays as it should. My Casino is superb, and it’s ideal for playing many of the songs from Revolver, Abbey Road and other albums besides. I saw this one in a shop in Devon, my wife just loved the sunburst, and convinced me to buy it. “I had a hankering for a rosewood Tele, as per George playing on the roof of the Apple building in ’69, and saw this Japanese reissue in a shop whilst on holiday in London. I was unsure, until Carole said I must buy it because it looked so unusual, which it did of course compared to some of the others in bright solid colours. 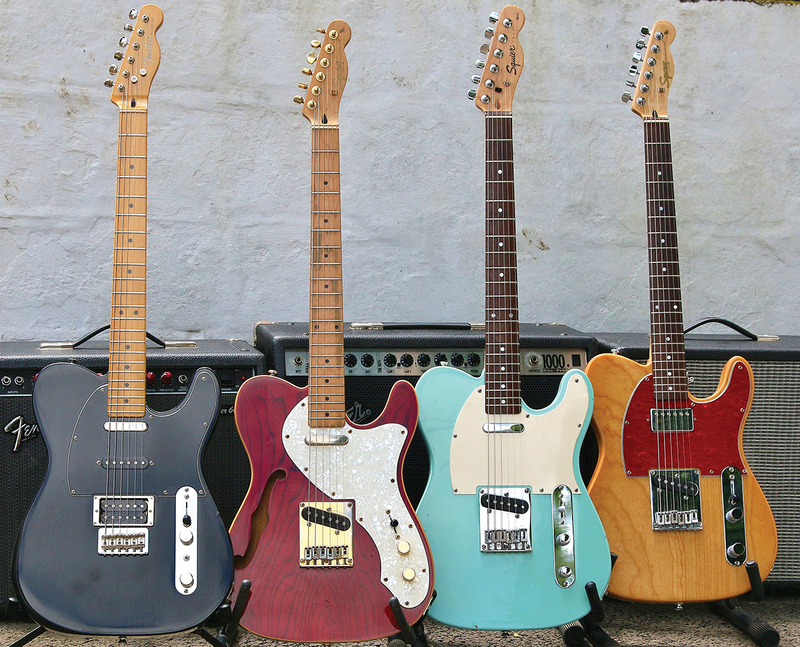 Bill also has a fine collection of Telecasters in a variety of finishes and hardware permutations, which he’s keen to show us. 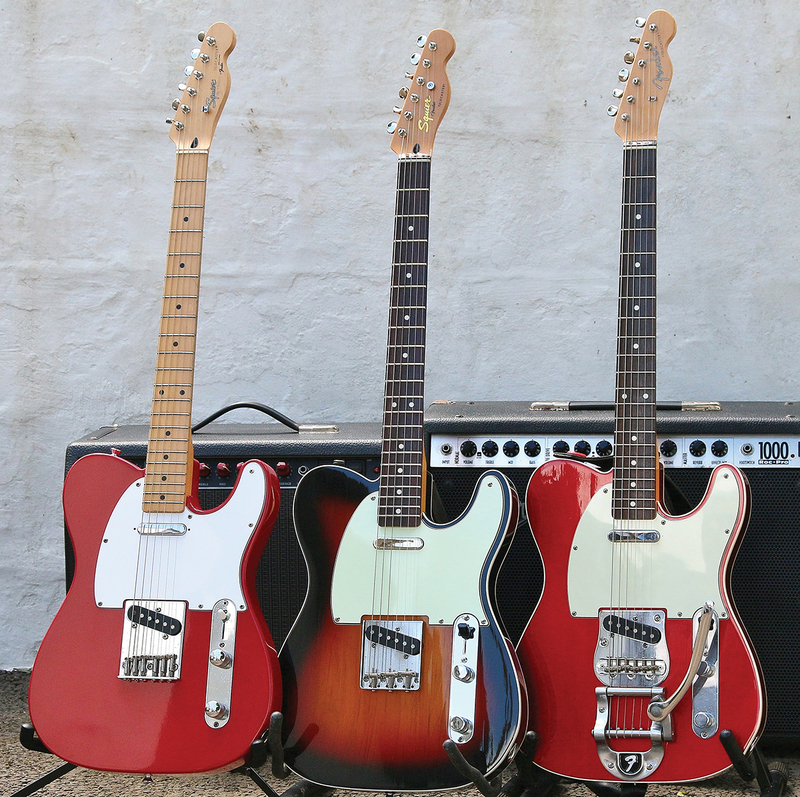 “I have around seven more Telecasters, USA-built Fenders, Japanese reissues and the Squier Pro Tone Series, the latter of which between ’95 and ’97 apparently outsold USA-built Teles,” he says. 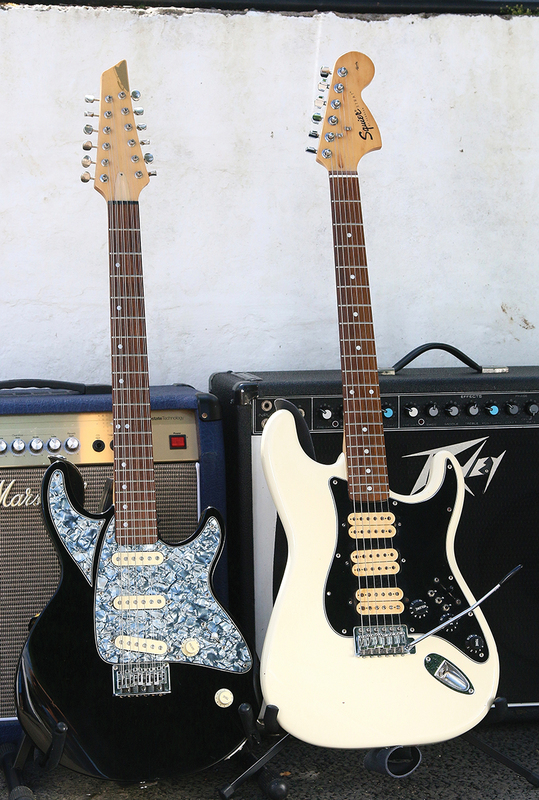 “Strats also work for me, not just because of George’s Rocky though, but what can I say that hasn’t already been said about a Strat? 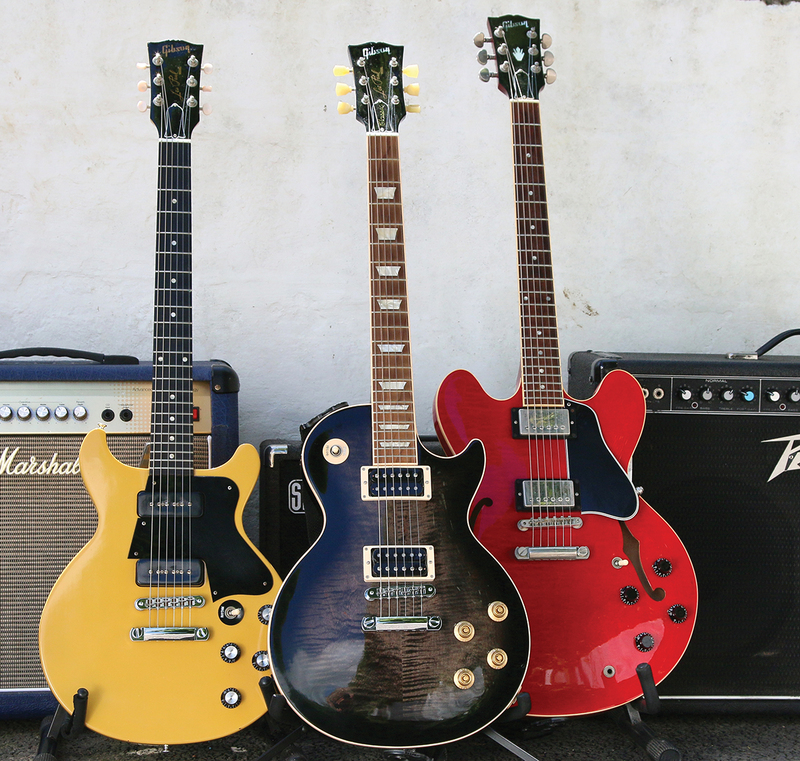 I have four at the moment, including a USA ’57 reissue I bought from a guy I worked with back in ’93. It really was an under-the-bed guitar, as he only played classical nylon-strung guitar. 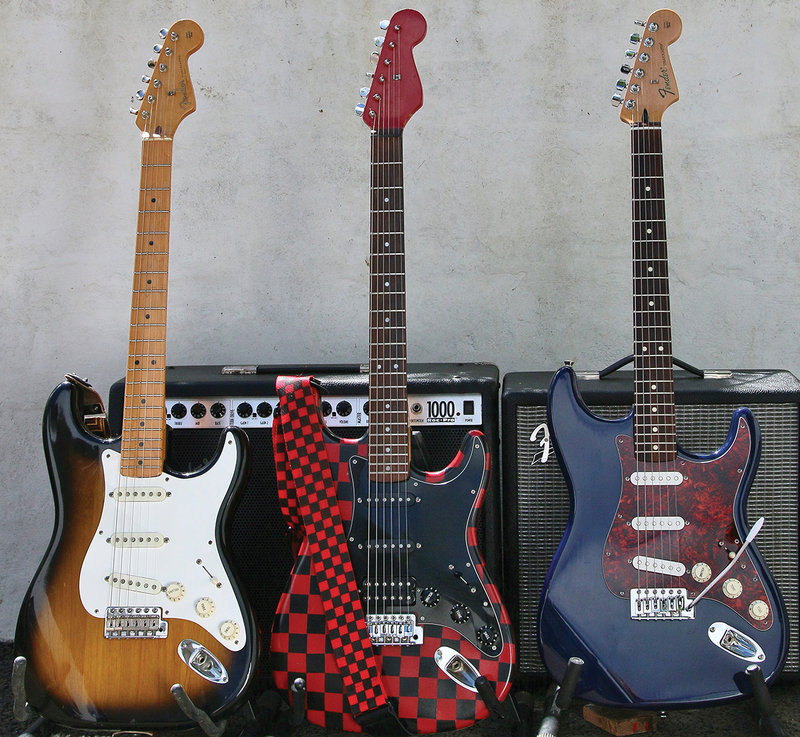 “I reckon the Strat I have with a red and black chequered finish must have belonged to a player in a ska band. It also has a matching strap. It was up for £14 in a local market. I wandered about looking at the meats and cheeses while I thought about it, went back, and my wife had knocked him down to £12. 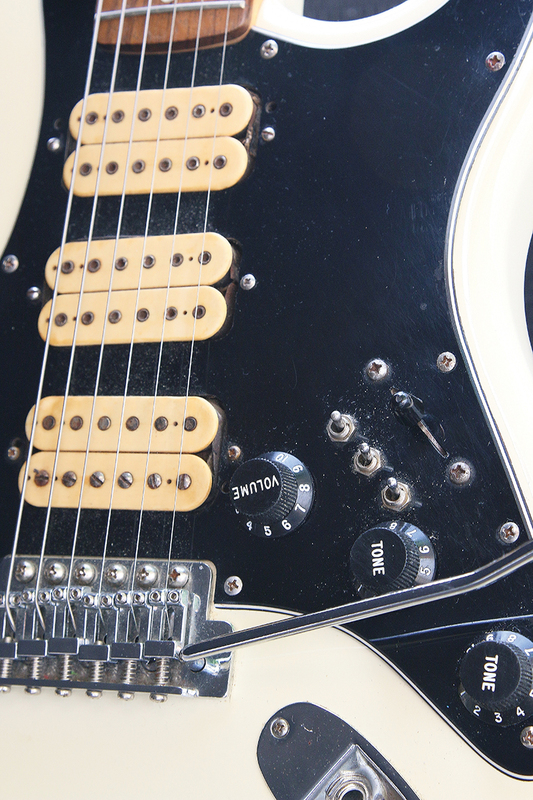 “When I bought a Mocha Brown ’77 Strat, the scratchplate was loaded with three Seymour Duncan humbuckers from the 70s, complete with coil tap facilities, which I installed in my white Squier Anniversary Strat. 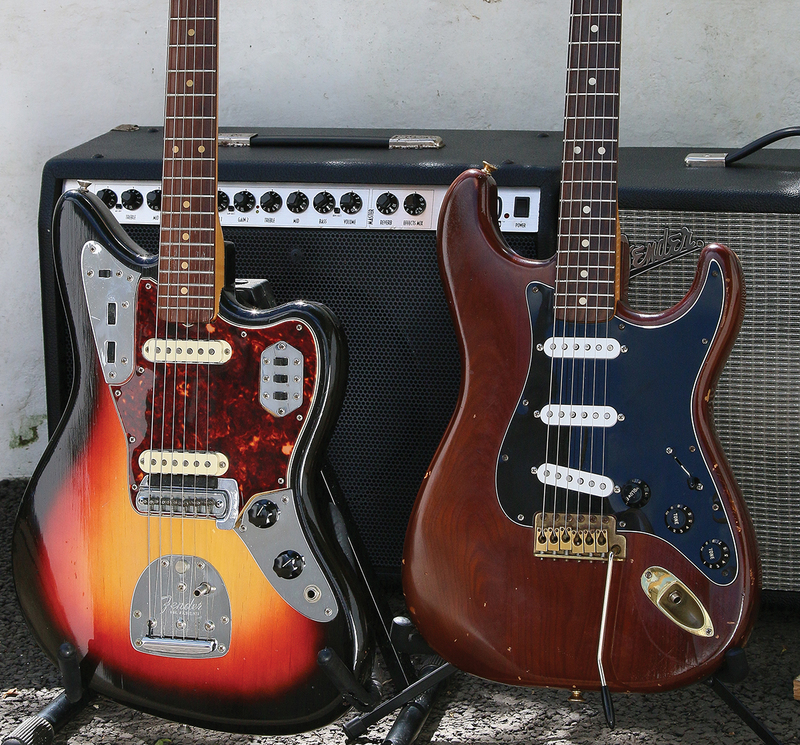 “I love my Fender Jaguar, that dates from ’64. It’s a particularly clean one, and belonged to a London session player called Tom Bowker. It’s such an ideal all-round guitar for rhythm and lead work. 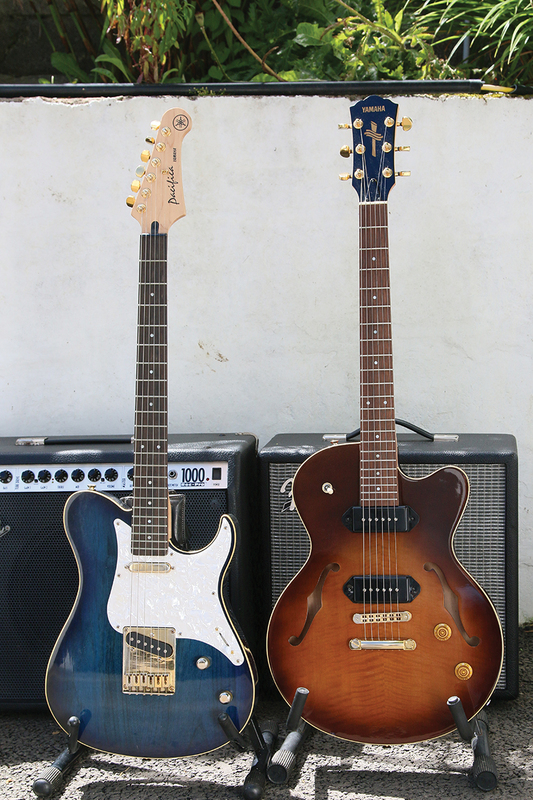 Bill had never been a fan of Gibsons with humbuckers – until he went on another holiday with his wife, that is. 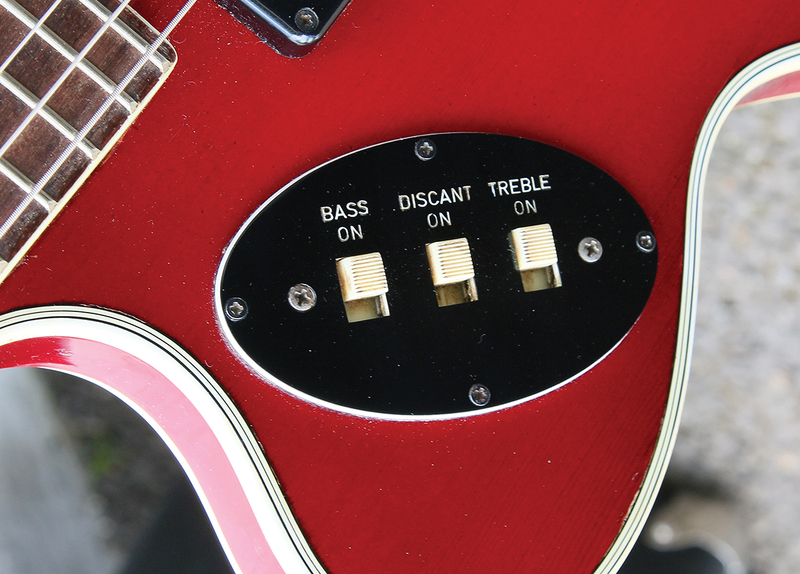 “For a long time, the only Gibson I owned was the SG,” he admits. “I couldn’t get on with the darker sound of Les Paul humbuckers. We were on holiday in Somerset during Christmas week, and of course ended up in a guitar shop, where Carole kept on about this Les Paul Classic. She knew about my feelings for the humbuckers, but insisted I try it because it looked so cool. What I was unaware of was the fact this model has the baked maple fingerboard, which looks like pau ferro or light rosewood. Not only is it fast, it certainly contributes to a brighter sound, too. “I’m loving this guitar. At the time, I felt it was far too expensive and left the shop with my tail between my legs. I decided to go back for it a few days later, but they said it had been sold to some guy who came in the same day as me. Anyway, I’ll be buggered if it wasn’t under the tree all wrapped up on Christmas morning. Carole bought it behind my back. 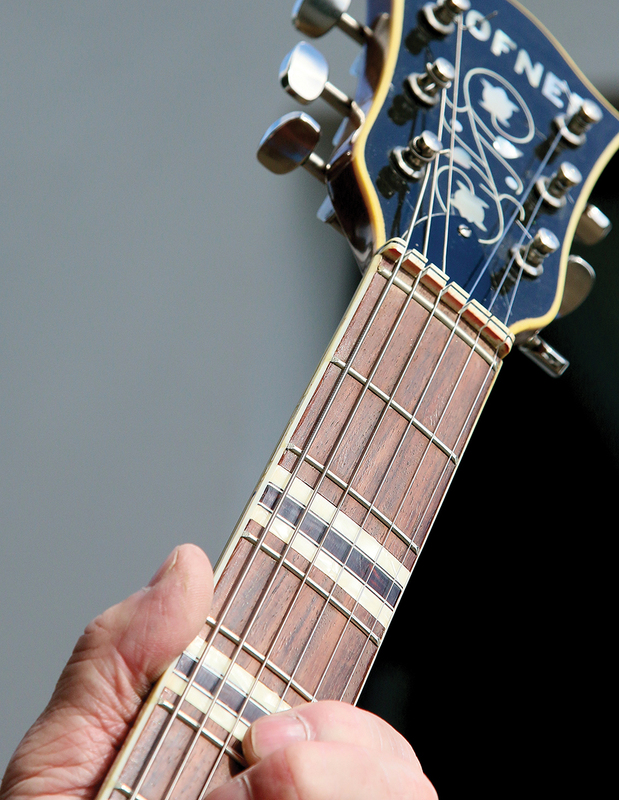 With his heart firmly stuck in the 1960s, Bill next shows us a classic instrument that’s in near-mint condition. 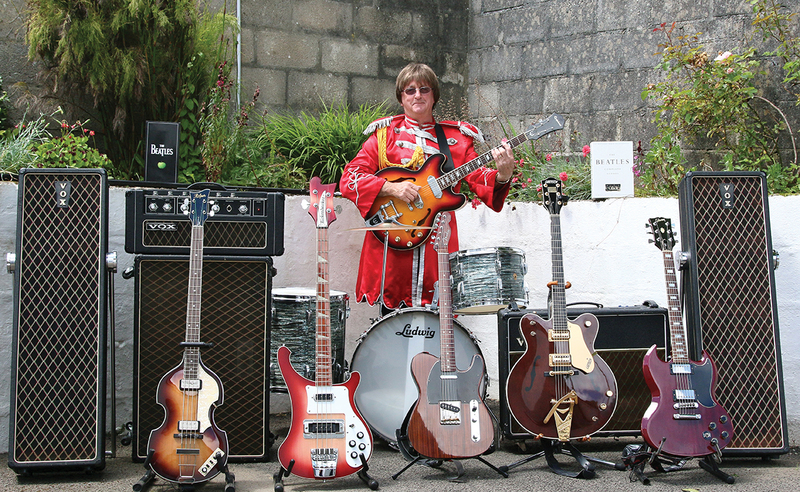 “My mid-60s Hofner Verythin is the cleanest example I’ve ever seen,” he reports happily. 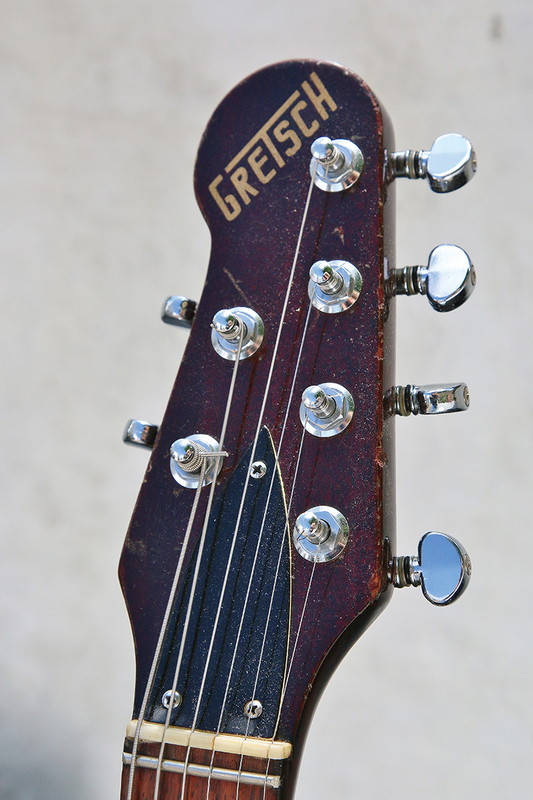 “It had been gathering dust on top of someone’s wardrobe in a shabby case for years,and was almost unplayable strung with acoustic strings with a 64-gauge low E. I spent ages cleaning it, and was amazed as I watched it unfold and blossom – the fingerboard looks untouched. “My First Act Garage Master model was part of a promotional giveaway in the USA when you bought a Volkswagen car. Mine doesn’t have the car logo, but it’s a really nice guitar. 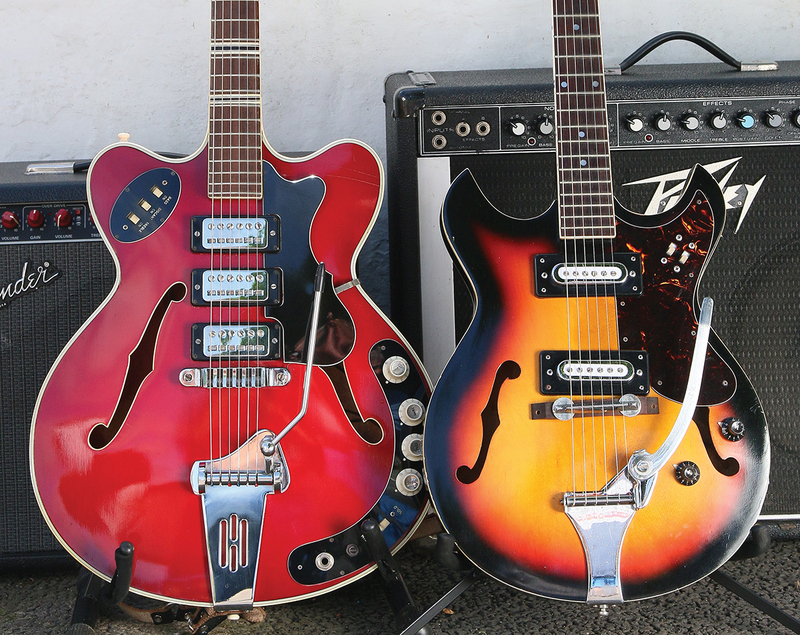 How cool would it have been to buy a VW Beetle and get a guitar as well? 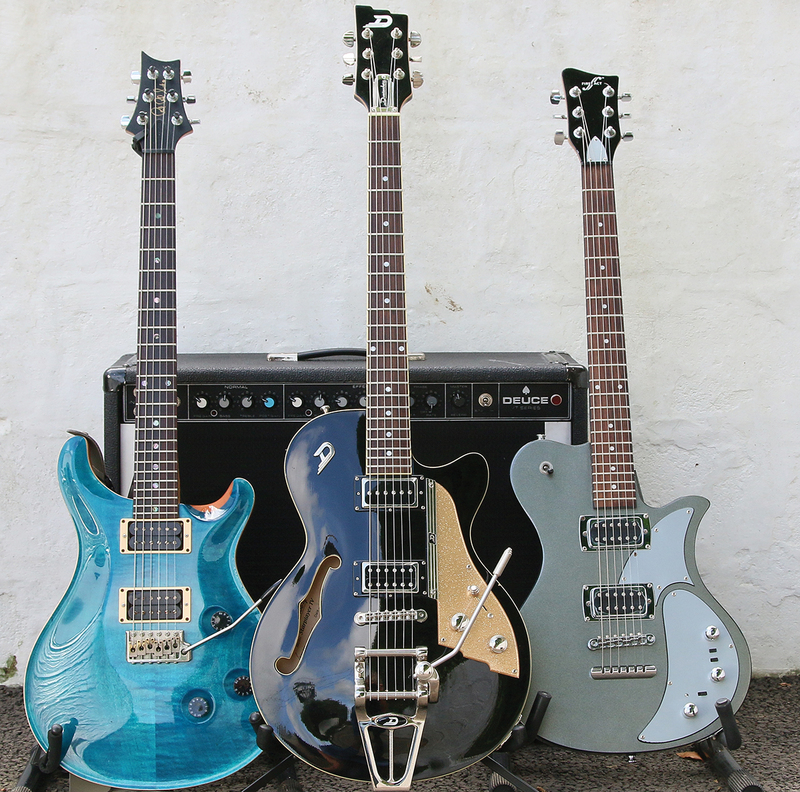 “My Duesenberg semi-hollow Starplayer TV is one of the latest additions to my collection. It can cover nearly all styles,from country to metal,and the company’s own Deluxe Tremola design is really smooth and accurate.